The 56Fe16.6Cr25Ni0.9Si0.5Mn austenitic superalloy has been produced in an induction furnace; it was made from granular ferro-scrap, ferrochrome, ferrosilicon, and ferromanganese materials. Originally, this alloy had been proposed for use in high mechanical loads and high temperature conditions (such as in nuclear and fossil fuel power plant facilities). Tensile strength tests showed that the alloy has an average yield strength of about 430.56 MPa, which is higher than Incoloy A-286 (a commercially available alloy). A combination of microscopy techniques by means of an optical microscope, X-ray diffraction [XRD], scanning electron microscopy [SEM], and transmission electron microscopy [TEM] techniques were applied in order to get detailed information about the fine structure of the alloy. XRD confirmed that the alloy matrix exhibits an FCC crystal structure with a lattice parameter of about 3.60 Å and grain sizes ranging from 50 to 100 µm. The results of the TEM analysis revealed the new type of precipitations that formed at the grain boundaries. These needle-like precipitations, probably Fe/Cr-rich precipitations of the (Fe,Cr)xCy type, acted as the source of intergranular corrosion (IGC). Small coherent plate-like and much smaller granular precipitations were found distributed homogenously along grain boundaries and inside the grains. Combining the tensile strength test and microstructure analysis suggested that these precipitations play significant roles in the hardness of the investigated sample. A 56Fe15Cr25Ni0.9Si0.5Mn austenitic superalloy steel was successfully synthesized from ferro-scrap, ferrochrome, ferrosilicon, and ferromanganese by using an induction furnace with a yield strength higher than that of the commercially available A-286 alloy (i.e., 430.56 MPa). The XRD confirmed a lattice parameter of about 3.60 Å with typical lattice planes of (111), (200), (220), (311), and (222), which extended in the interval angle of 2? between 30o and 120o. The microstructure of the specimen exhibited (Fe,Ni,Cr)xCy precipitation, which was distributed along the grain boundary; this can be observed in typical elongated grains and sub-grains. 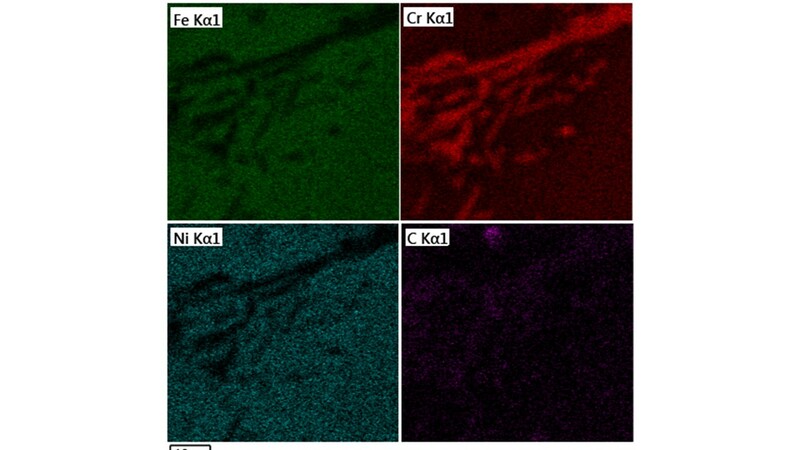 The results of the SEM investigation (BSE technique) of the microstructure showed that there was ferro-chromium carbide and a small amount of impurity (such as MnS). The authors would like to express their gratitude to Mr. Gunawan, the head of the Center for Science and Technology of Advanced Material at the National Nuclear Energy Agency, for his support. The authors would also like to express their gratitude to Dr. Damar Rastri Adhika from the Research Center for Nanosciences and Nanotechnology ITB – Bandung Indonesia, for the opportunity to do the transmission electron microscopy analysis that was presented in this work. In addition, the authors would like to thank Mr. Bambang Sugeng for the XRD analysis.